Are you afraid of dark or too bright light taking away your sleep? Are you always worried about the elderly or kids falling down at stairs? Are you troubled with the closet that is too dark to choose the clothes? Comfort kids who are afraid of the dark. Say goodbye to bumping into stuff in the dark. Make it energy-saving and cheaper than ceiling lights. Using the passive infrared technology, URPOWER Motion Sensor Light can automatically detect human motion within 7-9ft and turn off after 12-15 seconds if no motion detected. It is more convenient and quick to install with different installation ways. Best motion sensor light for your kitchen, cabinets, stairs, hallway, bathroom and so on. Luminous Flux: 40 lumen per lamp. 1. Stick the 3M adhesive magnetic strip on the wall, then attach the lamp to the trip. 2. Install the light by the screws included. 3. Stick the 2 plastic parts on the wall, then mount the light. USB Rechargeable and Energy Saving: The motion sensor light takes only 2-3 hours to be fully charged and lasts for 3-4 hours in Steady On. You can use even it is being charged. Perfect for closet, cabinet, kitchen, stairs and other indoor places. 2 Lighting Modes: Automatic Sensor/ Steady On. It can satisfy your different demands as the night light can be used as normal night light or motion sensor light with different modes. 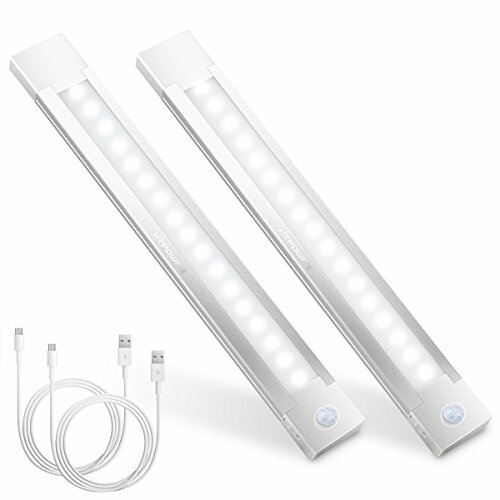 Sensitive Motion Sensor : The motion sensor closet light will turn on in darkness within sensing range 120°, 7-9ft and auto off after 12-15 seconds without motion. 3 Easy Installation Ways : 3M double sides adhesive tape/ plastic pothook included make you can stick the cabinet light or hang on the hook anywhere, no any tools are needed, safe and convenient to use.